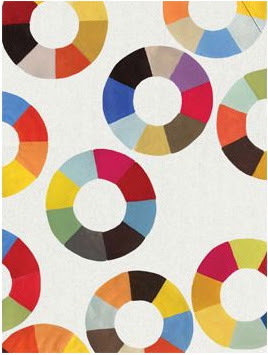 All artwork © Lulu de Kwiatkowski, AMMO Books, 2007. When it finally does hit shelves -- hopefully in September not November -- the large-format volume should be lush since art house publisher Ammo Books is behind it. 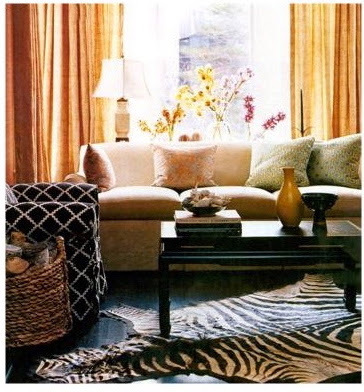 I love how Anne Coyle used Lulu DK fabrics ("Porcupine" and "Chant") to bring a fresh edge to a trad Chicago family home, above; photos by Bob Hiemstra for O at Home, spring 2005. Image originally appeared in Southern Accents, July-August 2003; photo by Pieter Estersohn. 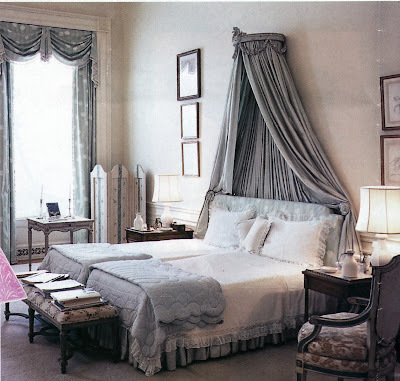 BTW: Charleston-based Amelia Handegan -- always timeless but a little unpredictable -- is the decorator here, and the room was featured in a special bedroom "book-azine" that Southern Accents put together a few years ago. 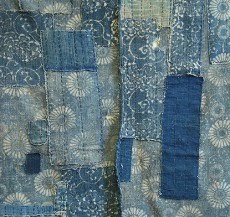 Click on the word suzani, under labels, for a host of suzani-related sources.. 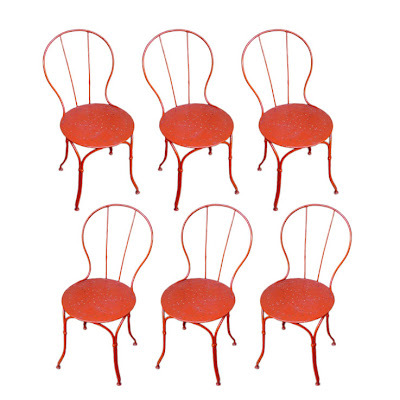 Above, six Napoleon III French painted iron garden chairs, with star pattern punched in the seats, circa 1850, available through Lucullus. Above, iron garden chairs used indoors, in a room designed by Jan Showers. The High has a strong collection of mid-to-late 19th century furniture -- not a period I'm most passionate about -- so when I was a docent there, I challenged myself to become more enthused about the era. Iron garden chairs and tables were pieces I could get into. Polar opposites of heavy, dark, ornate Victorian and Napoleonic furniture, these iron creations are light, airy and fresh. Even a century later. Related past post: Curls and Swirls. New Orleans has always been such a diverse, eccentric place. 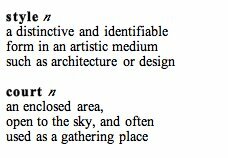 Consequently, there's not one definitive Crescent City look. But there is a common thread: soul. Whether it's a humble Creole cottage or elegant Garden District home, many New Orleans interiors are filled with objects that have great personal meaning to the occupants. Residents also tend to buck the trends, and celebrate the sweet life. As manager of the culinary antiques store Lucullus, Kerry Moody has acquired an abundance of fine 18th-and 19th century tableware. In his modest home he uses precious porcelain and silver, and Louis XV chairs. I love how his holiday table, above, is set with antique apple-green Vieux Paris soup bowls. Above, Virginia Freeman Rowan represents polished New Orleans. 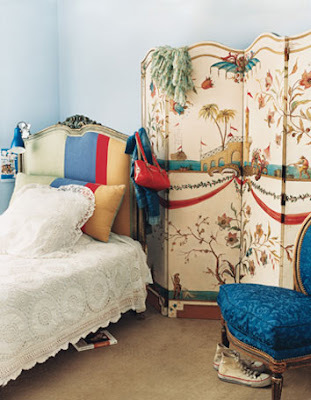 In her home, refined European antiques and ball-gown curtains mingle happily with kids and pets. 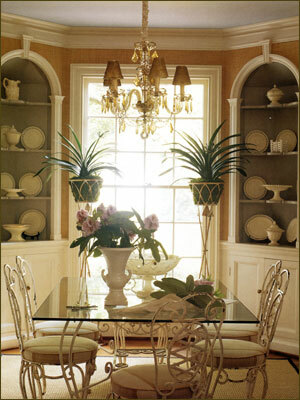 The soft creamy interior shown here is her family room. 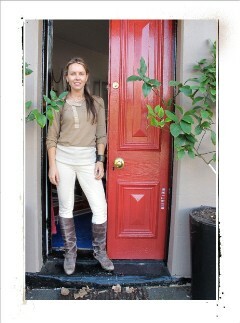 She prefers neutral backgrounds that never become dated and accommodate a lifetime of collecting. Above, from Lucullus, a French modernist table cube in the Xavier Pauchard style, circa 1935; along with a set of late 19th century French iron garden chairs, circa 1880. Above, Thomas Jayne collaborated with Robert Clepper to evoke the feel of a bohemian artist's early 20th century New Orleans apartment in this 350-square-foot French Quarter home. One of the challenges Jayne faced was working with Clapper's vast art collection. 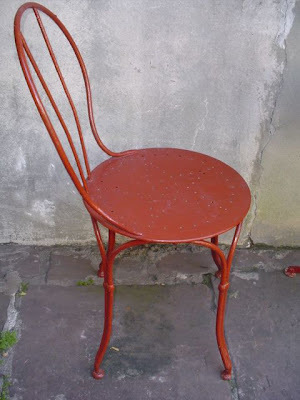 As a back-drop, vibrant creole color is used inside and out. The lush courtyard is positively iconic. 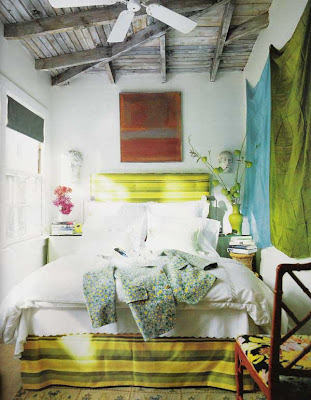 Photo by Tim Street-Porter for Cottage Living, October 2006. 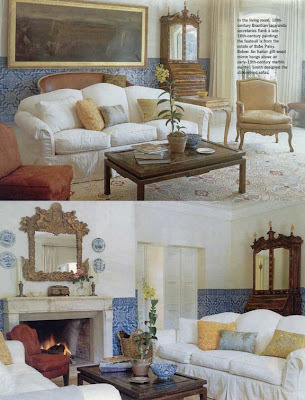 Interior design above, Vesta Fort; photo, Paul Costello for Domino, May 2006.. Above is JBK's circa 1960 White House bedroom, decorated by Sister Parish with headboard covered in, I believe, Dek Tillett daisy print cotton. 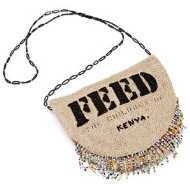 Image via Elle Decor. 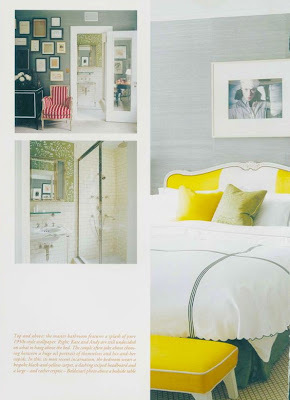 Photography above, Eric Morin for World of Interiors, December 2006. 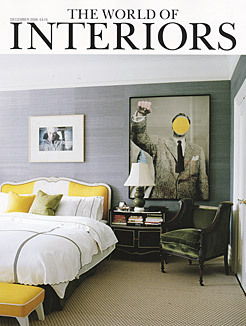 Another look I've always liked is Kate and Andy Spade's yellow-striped upholstered headboard, seen on World of Interiors' 25th anniversary cover. 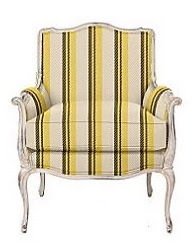 With its French-style frame, it could be too fussy, but the crisp white paint and ultra wide stripes make it look almost modern. 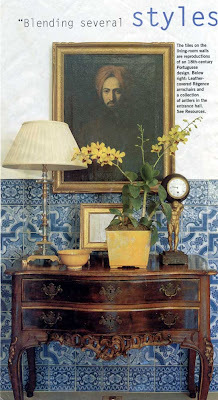 Photo above, Pieter Estersohn for Elle Decor, June-July 2001. For his tiny beach house, decorator Todd Romano used a very tailored upholstered headboard with stripes placed on the horizontal. 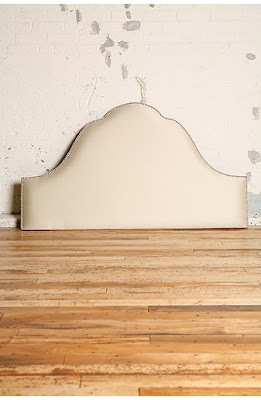 Always inspiring Nick Olsen, over at Domino, recently talked about the idea of buying Urban Outfitters' economical Regency Headboard, above, just for the cool shape, and recovering it D.I.Y. Be sure to see his post. Photo above by Gemma Comas for Domino, January/February 2006. For the fabric-obsessed, an upholstered headboard offers an opportunity to use a beloved print in a way that is less costly than covering a whole sofa or wing chair. But this option is a big commitment. 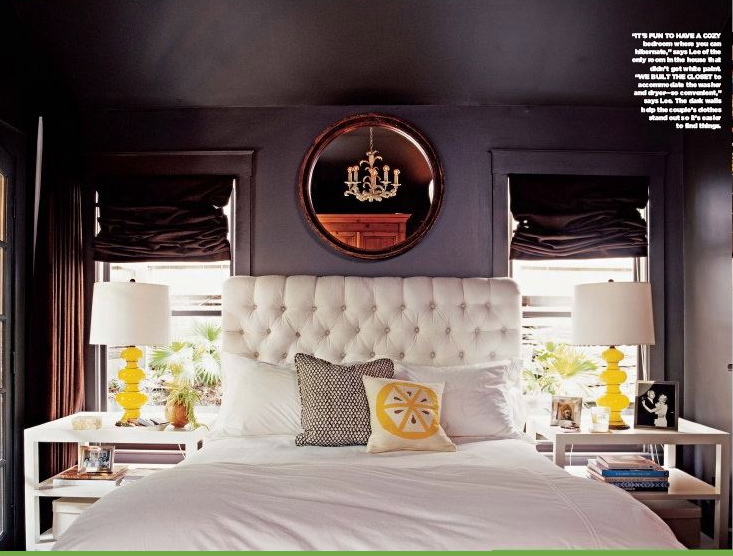 Usually a boldly patterned headboard leaves little freedom for changing other elements in a bedroom down the road. A solid linen headboard though, like Krista Ewart's below, provides graphic punch and versatility. Photo above by Melanie Acevedo for Domino, June/July 2007. 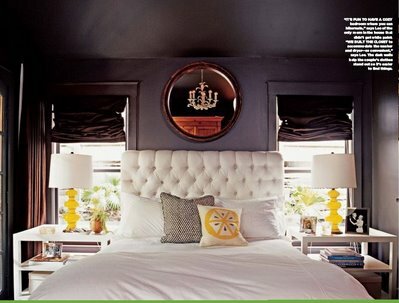 The same goes for Lee Kleinhelter's tufted-white headboard, below. It is glamorous and flexible. Striped headboards can be a compromise between a lavish floral and a plain solid. And of course, a fabric-covered screen (or a handsome leather one) can be used in lieu of a headboard, then later moved to another setting. 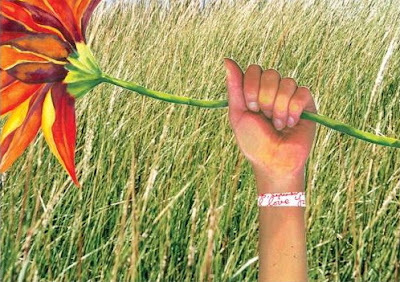 Photo above by Max Kim-Bee for Domino, June 2006. To me, half the fun is the hunt for an exciting piece. If you're interested in open-work wood screens or panels, Mandarin Antiques in Atlanta is a great place to explore. A house in Normandy, as seen in House Beautiful, April 2004. When she restored her family's 17th-century French hunting lodge, Sally Perrin somehow managed to keep a bit of that lush "Sun King" feel but loose the ostentation. 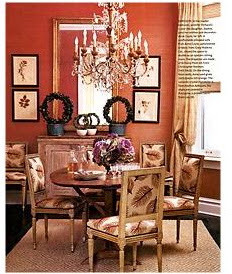 To me, the ikat curtains look amazing against those sumptuous red walls. 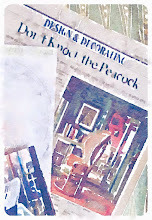 Before she was Editor-in-Chief of Elle Decor, Margaret Russell produced the feature on ikat, above. Click to enlarge and read the captions. Above, a large ikat throw, proper monogram pillow and Chinese porcelain are all part of the mix in Brazilian architect Sig Bergamin's home. 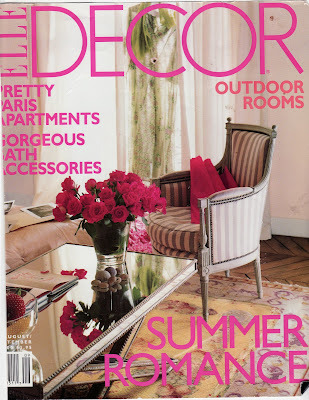 Image is from Elle Decor. In her family's study, free-wheeling Lorraine Kirke -- wife of Bad Company drummer, Simon Kirke -- abandons the decorating rule-book and hangs pictures of her kids on the wall in a loose composition. Photography above by Ivan Terestchenko. This bedroom in Mississippi-born textile connoisseur Lisa Fine's sumptuous Paris apartment made for the loveliest Elle Decor cover, back in August 2000. 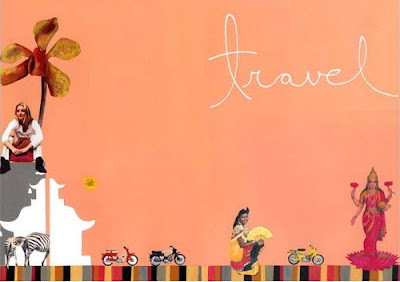 But her amazing Indian-inspired headboard didn't show in the shot. Here it is below, on my TV screen, as seen in HGTV's one-hour special, Homes of Paris. Fine's own custom embroidered headboard was such a success that she began producing them. 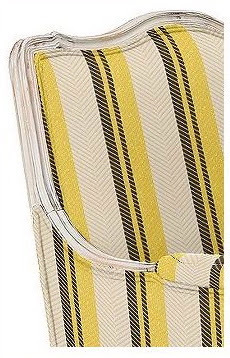 I hope soon to have better images and updated information to share. 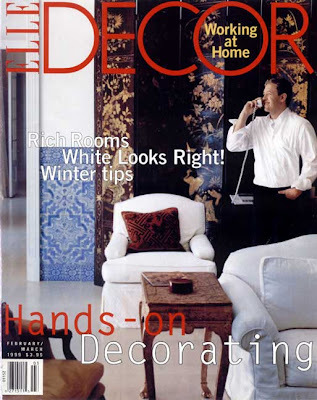 All images above, Elle Decor; photography, Lisa Romerein; tile work by Los Angeles-based Lascaux Tile. Margaret Russell once described Michael Smith's Portuguese-inspired Montecito project, above, as "magical." And HGTV featured the residence among its 10 Most Beautiful Homes. 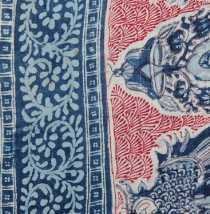 That living room, with its unexpected wainscot of blue-and-white patterned tiles, seems to take everyone's breath away. 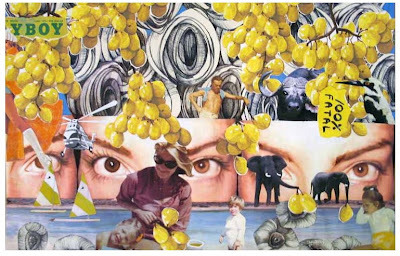 "It was a once in a lifetime tile project," says Lenore Eisner of Lascaux Tile, the crafts-people behind the scenes of Smith's masterpiece. 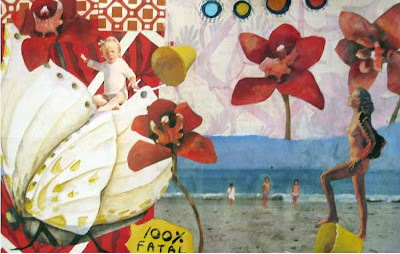 When Smith's team first showed Eisner a concept drawing, her reaction was, "Wow. 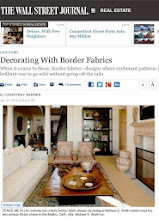 I was really impressed because I'd never heard of anyone in America doing a tiled living room wainscot [although] it was common in Portuguese and Spanish manors." Smith and his clients had been trekking across Portugal, studying its traditional architecture and rich fusion of cultures. They provided Eisner with 18th-century tiles and photos from the National Tile Museum in Lisbon. 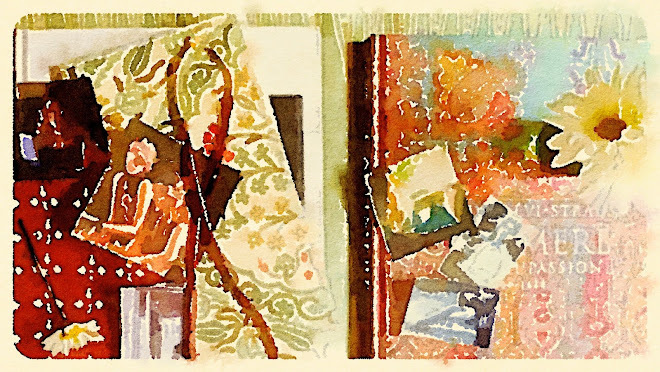 Her brief was "To try and match [the tiles] for their tones of blue, character of painting, and background color. Lead was used in the old tiles and it softens up the colors, so we had to research the new glazes to achieve that effect. My associate studied in Portugal years before, and learned tile making there, so he was familiar with traditional techniques. We tested and submitted many samples until they were approved. The tile portion of the project just kept growing." In the end, Lascaux was involved with numerous exterior and interior spaces on the property. "Smith was generous with the tiles and their placement. He drove them right to the ceiling and used intensive pattern for maximum effect. Each of the tiled rooms was successful, distinctive and more beautiful than the next," adds Eisner. To see a full range of Lascaux's exquisite hand-painted tiles visit their site. 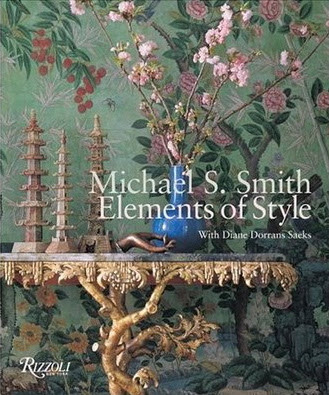 The Montecito home is also featured in Michael Smith Elements of Style. See also, Candida Hofer: In Portugal.